Coding for MIMO Communication Systems is a comprehensive introduction and overview to the various emerging coding techniques developed for MIMO communication systems. The basics of wireless communications and fundamental issues of MIMO channel capacity are introduced and the space-time block and trellis coding techniques are covered in detail. Other signaling schemes for MIMO channels are also considered, including spatial multiplexing, concatenated coding and iterative decoding for MIMO systems, and space-time coding for non-coherent MIMO channels. Practical issues including channel correlation, channel estimation and antenna selection are also explored, with problems at the end of each chapter to clarify many important topics. 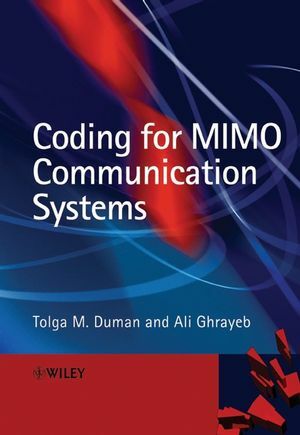 This book is aimed at advanced undergraduate and postgraduate students, researchers and practitioners in industry, as well as individuals working for government, military, science and technology institutions who would like to learn more about coding for MIMO communication systems. Tolga M. Duman received the B.S. degree from Bilkent University, Ankara, Turkey, in 1993, M.S. and Ph.D. degrees from Northeastern University, Boston, in 1995 and 1998, respectively, all in electrical engineering. Since August 1998, he has been with the electrical Engineering Department of Arizona State University, first as an Assistant Professor (1998-2004), and currently as an Associate Professor. He spent the 2004-05 academic year as a visiting associate professor at Bilkent University in Turkey. Dr. Duman's current research interests are in digital communications, wireless and mobile communications, MIMO systems, channel coding, underwater acoustic communications, and applications of coding to wireless and recording channels. Dr. Duman is a recipient of the National Science Foundation CAREER Award and IEEE Third Millennium medal. He is a senior member of IEEE, and an editor for IEEE Transactions on Wireless Communications and IEEE Transactions on communications. Ali Ghrayeb received the Ph.D. degree in electrical engineering from the University of Arizona, Tucson, AZ, in May 2000. He is currently an Associate Professor in the Department of Electrical and Computer Engineering, Concordia University, Montreal, Canada. He holds a Concordia Research Chair in High-Speed Wireless Communications. His research interests are in wireless and mobile communications, wireless networks, and coding and signal processing for data transmission and storage. He has co-instructed technical tutorials and short courses on coding for MIMO Systems and on Synchronization for WCDMA Systems at several major IEEE conferences. He serves as an Associate Editor for IEEE Transactions on Vehicular Technology and Wiley Wireless Communications and Mobile Computing Journal. 1.1 Need for MIMO Systems. 1.2 MIMO Communications in Wireless Standards . 1.4 Other Topics in MIMO Systems. 2 Fading Channels and Diversity Techniques. 2.1.1 Path Loss, Shadowing and Small Scale Fading. 2.2 Error/Outage Probabilities over Fading Channels. 2.2.1 Outage Probability for Rayleigh Fading Channels. 2.2.2 Average Error Probabilities over Rayleigh Fading Channels. 2.2.3 Extensions to Other Fading Channels. 2.2.4 Performance over Frequency Selective Fading Channels. 2.3.2 System Model for Lth Order Diversity. 2.3.3 Maximal Ratio Combining (MRC). 2.4 Channel Coding as a Means of Time Diversity. 2.4.1 Block Coding over a Fully Interleaved Channel. 2.5 Multiple Antennas in Wireless Communications. 2.5.2 Smart Antennas and Beamforming. 2.6 Chapter Summary and Further Reading . 3 Capacity and Information Rates of MIMO Channels. 3.1 Capacity and Information Rates of Noisy Channels. 3.2 Capacity and Information Rates of AWGN and Fading Channels. 3.3 Capacity of MIMO Channels. 3.3.3 Non-Ergodic MIMO Channels and Outage Capacity. 3.3.4 Transmit CSI for MIMO Fading Channels. 3.4 Constrained Signaling for MIMO Communications. 3.5 Discussion: Why Use MIMO Systems? 3.6 Chapter Summary and Further Reading. 4.1 Transmit Diversity with Two Antennas: The Alamouti Scheme. 4.1.2 Optimal Receiver for the Alamouti Scheme. 4.1.3 Performance Analysis of the Alamouti Scheme. 4.2 Orthogonal Space-Time Block Codes. 4.2.2 Decoding of General Space-Time Block Codes. 4.2.3 Performance Analysis of Space-Time Block Codes. 4.3 Quasi-Orthogonal Space-Time Block Codes. 4.5 Chapter Summary and Further Reading. 5.1 A Simple Space-Time Trellis Code. 5.2 General Space-Time Trellis Codes. 5.2.2 Decoding of Space-Time Trellis Codes. 5.3 Basic Space-Time Code Design Principles. 5.3.2 Space-Time Code Design Principles. 5.3.3 Examples of Good Space-Time Codes. 5.3.4 Space-Time Trellis Codes for Fast Fading Channels. 5.4 Representation for Space-Time Trellis Codes for PSK Constellations. 5.4.2 Improved Space-Time Code Design. 5.5 Performance Analysis for Space-Time Trellis Codes. 5.5.1 Union Bound for Space-Time Trellis Codes. 5.5.2 Useful Performance Bounds for Space-Time Trellis Codes. 5.6 Comparison of Space-Time Block and Trellis Codes. 5.7 Chapter Summary and Further Reading. 6.1 Basic Bell Labs Layered Space-Time (BLAST) Architectures. 6.1.2 Detection Algorithms for Basic BLAST Architectures. 6.2.1 Detection Algorithms for DBLAST. 6.3.2 Group Interference Cancellation Detection. 6.4.2 Threaded Space-Time Code Design. 6.4.4 Detection of Threaded Space-Time Codes. 6.5 Other Detection Algorithms for Spatial Multiplexing Systems. 6.5.4 Reduced Complexity ZF/MMSE Detection. 6.6 Diversity/Multiplexing Gain Trade-off . 6.7 Chapter Summary and Further Reading. 7 Concatenated Codes and Iterative Decoding. 7.1 Development of Concatenated Codes. 7.2 Concatenated Codes for AWGN Channels. 7.2.4 Performance with Maximum Likelihood Decoding. 7.3 Concatenated Codes for MIMO Channels. 7.3.1 Concatenated Space-Time Turbo Coding Scheme. 7.3.2 Turbo Space-Time Trellis Coding Scheme. 7.3.3 Turbo Space-Time Coding Scheme. 7.4 Turbo Coded Modulation for MIMO Channels. 7.5 Concatenated Space-Time Block Coding. 8 Unitary and Differential Space-Time Codes. 8.1 Capacity of Noncoherent MIMO Channels. 8.2.2 ML Detection of USTCs. 8.2.4 Construction of Unitary Space-Time Signals. 8.3.1 Differential Space-Time Coding for Single Antenna Systems. 8.3.2 Differential Space-Time Coding for MIMO Systems. 8.4 Turbo Coded Unitary Space-Time Codes. 8.5 Trellis Coded Unitary Space-Time Codes. 8.6 Turbo Coded Differential Space-Time Codes. 8.7 Chapter Summary and Further Reading. 9 Space-Time Coding for Frequency Selective Fading Channels. 9.1 MIMO Frequency Selective Channels. 9.2 Capacity and Information Rates of MIMO Frequency Selective Fading Channels. 9.2.1 Information Rates with Gaussian Inputs. 9.2.2 Achievable Information Rates with Practical Constellations. 9.3 Space-Time Coding for MIMO FS Channels. 9.3.1 Interpretation of MIMO FS Channels Using Virtual Antennas. 9.3.2 A Simple Full Diversity Code for MIMO FS Channels. 9.3.3 Space-Time Trellis Codes for MIMO FS Channels. 9.3.4 Concatenated Coding for MIMO FS Channels. 9.3.5 Spatial Multiplexing for MIMO FS Channels. 9.4 Channel Detection for MIMO FS Channels. 9.4.1 Linear Equalization for MIMO FS Channels. 9.4.2 Decision Feedback Equalization for MIMO FS Channels. 9.4.3 Soft Input Soft Output Channel Detection. 9.4.4 Other Reduced Complexity Approaches. 9.6 Chapter Summary and Further Reading. 10 Practical Issues in MIMO Communications. 10.1 Channel State Information Estimation. 10.1.1 CSI Estimation Using Pilot Tones. 10.1.2 What to Do with CSI? 10.1.3 Space-Time Coding Examples with Estimated CSI. 10.2 Spatial Channel Correlation for MIMO Systems. 10.2.1 Measurements and Modeling of Spatial Correlation. 10.2.2 Spatial Channel Correlation Models. 10.2.3 Channel Capacity with Spatial Correlation. 10.2.4 Space-Time Code Performance with Spatial Correlation. 10.4 MIMO Communication System Design Issues. 10.5 Chapter Summary and Further Reading. 11 Antenna Selection for MIMO Systems. 11.3 Antenna Selection for Space-Time Trellis Codes. 11.4 Antenna Selection for Space-Time Block Codes. 11.5 Antenna Selection for Combined Channel Coding and Orthogonal STBCs. 11.6 Antenna Selection for Frequency Selective Channels. 11.7 Antenna Selection with Nonidealities. 11.7.1 Impact of Spatial Correlation. 11.7.3 Impact of Channel Estimation Error. 11.8 Chapter Summary and Further Reading.